Social network mapping (SNM) can be a useful part of the research process by identifying relevant stakeholders in the adaptation planning process, eliciting information from them and highlighting, in a qualitative manner, where adaptive capacity will need to be built. In this way, SNM lays the foundation for more in-depth, quantitative analysis of specific institutions or decision-makers through other, specialised, methods. The result of a SNM exercise can support the understanding of the decision context that defines which criteria are essential in choosing tools in order to achieve an expected outcome. The following paragraphs describe basic network characteristics that define a socio-institutional network analysis and how these characteristics can relate specifically to the issue of climate change adaptation. When conducting network analysis it is useful to distinguish between the structure of the network (topology) and the content of the network (Bodin and Crona, 2009) which can both be described together as the ‘decision space’. The structural characteristics of a network have an effect on social processes such as knowledge transfer, information sharing, consensus building and power relations (Bodin and Crona, 2009). The content of the relational ties (both formal and informal) between actors is different in different networks depending on the types of actors involved and the flow and/or exchange of different types of ‘capital’ between the actors. The term ‘strength of connections’ in network mapping terminology refers a.) to the proximity of the actors to each other and b.) to the number of links between actors. In general, the closer the actors are to each other and/or the more the links, the stronger the bond between the actors. 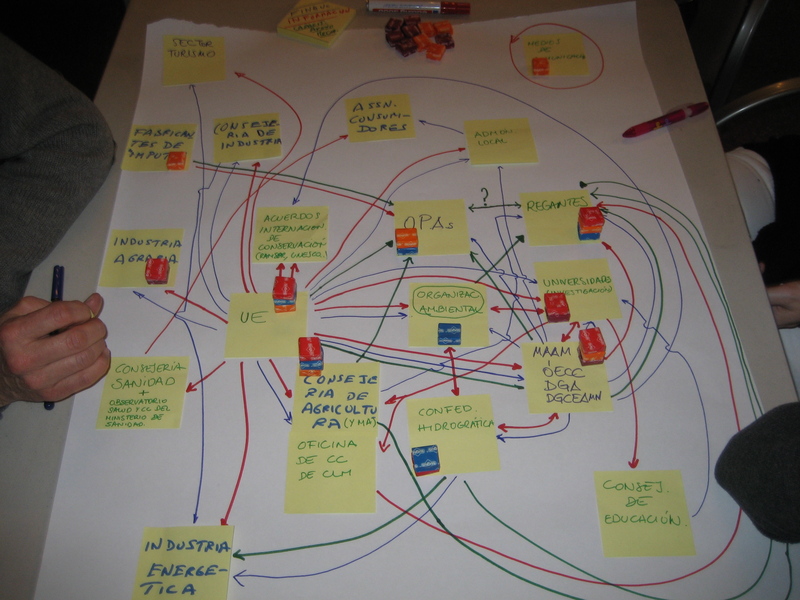 However, there can also be negative ties, which can have an influential effect in the network dynamics. Likewise, there is normally a threshold above which network density becomes counter-productive in facilitating collective action (e.g. Oh et al., 2004 in Bodin & Crona 2009). Moser and Ekstrom (2010) define barriers as obstacles that can be overcome, as opposed to limits and describe a systematic diagnostic framework rather than a prescriptive one for defining strategies to overcome barriers which are actor-governance and system-specific. Many barriers will make adaptation less efficient or less effective, lead to missed opportunities, or higher costs, although assuming that certain barriers (often perceived as ‘limits’) cannot be overcome (‘malleable barriers’) can itself be an obstacle to adaptation (Moser & Ekstrom 2010). In addition, a lack of links to important or influential actors can also be a barrier that needs to be addressed. The key feature of bridging actors is that they link actors and institutions that would not otherwise be linked and this means they play an important role in the network. In some cases they may span ‘clusters’ of actors who have specialized knowledge and thereby provide access to new knowledge for other clusters. Such mechanisms are reflected in ties between sub-groups known as ‘bridging ties’. A cluster can be defined where actors have significantly more ties between its group members than between members and non-members. This can be a barrier to joined-up thinking as the existence of many sub-clusters within the network - low ‘network cohesion’ – can produce ‘us-and-them’ attitudes or keep organizations with different agendas and goals far apart. The beneficial aspect of clusters is that they may facilitate the development of specialized and tacit knowledge within their own sub-groups. Amongst organizations this can enhance integrated management and cross-sectoral planning. There are two types of centrality in a network: degree centrality (number of ties an actor has) and ‘between-ness’ centrality (the degree to which an actor connects other actors who would not otherwise be connected). The former can be problematic if there is too much responsibility for one actor and this may be an area for intervention. As mentioned, the latter (also a bridging tie) can offer the possibility of influencing interactions between other actors and access to a diversity of resources/ flows/ knowledge/ information as a result of the bridging ties. Bridging ties can link clusters of homogenous actors to other different, yet homogenous actors, perhaps with their own specialized knowledge or field of expertise. These ties can link different types of actors both vertically and horizontally. It is often important to vertically link authorities at different scales to be effective and avoid potential maladaptation (Pelling et al. 2008). Adaptation is frequently initiated or undertaken in the context of non-climatic circumstances (e.g. land-use plan updates, infrastructure replacement, renovating a building). However, differing goals of various actors in the network can create obstacles to moving along the adaptation pathway, either because the different institutional goals or values and norms are not aligned or because there is disagreement about the strength of the climate signal or uncertainty in the potential benefits of adaptation measures (Berkhout et al. 2006). The perceived influence of the different actors in a network can offer insights into why overall objectives on climate adaptation are not – or are – being met. Outliers in the network can be interesting if they are also influential or have a large stake in the issue at hand and do not possess a large number or ‘bonding’ or ‘bridging’ ties. In either case, not being sufficiently linked to the network, means that there is room for intervention and capacity building to link to actors who are perceived as influential to the adaptation issue in question. This text is the summary of a deliverable of the FP7 Mediation project. Not yet a member? Register or log in to comment on this content. Sharing methods, tools and approaches for adaptation decision-making. The Quilca-Chili basin analysis is part of the Partnering for Adaptation and Resilience - Agua (PARA-Agua) or "For Water" project in Latin America. Guidelines and tools for assessing the social and biophysical vulnerability to climate change. Advancing new insights into good governance for sustainable development in the face of social and ecological change. Training modules on climate analysis, vulnerability assessment and adaptation planning.